NFL is undertaking Agriculture Extension Services with the objective to educate farmers on judicious use of fertilizers along with total know how on improved and scientific methods of cultivation and helping them to increase productivity. NFL lays great stress on technology transfer and providing value added products and services to farmers to farmers like free soil testing facility and conducting fertilizer education programmes like demonstrations, farmers trainings and educational visits, field days and providing crop literature for the benefit of farmers at village level. Dealers/Retailers are important link between company and farmers and key change agents in motivating the farmers to use fertilizers in a balanced manner and adopting Integrated Nutrient management. During the year 2017-18, 58 Dealer’s/Retailer’s Orientation Programmes were conducted and more than 5000 dealers/ retailers were benefitted. Through these educational programmes, farmers were facilitated by upgrading their knowledge regarding fertilizers, Agro products and improved crop practices so that latest information can be disseminated to farmers at point of purchase to the farmers. It is essential to educate the farmers on issues related to soil testing, soil health, balanced fertilization etc. to optimize farmer’s crop yield and farm income. 57 farmer training programmes were organized during 2017-18 and more than 3500 farmers benefited. During these educational programmes, farmers were sensitized to issues related to soil fertility status including deficiency of various nutrients their remedy to increase fertilizer use efficiency and maximize yields. The farmers have also been educated on benefits of long term usage of Biofertilizers and City Compost through these programmes. Agriculture Universities, Research Stations, Krishi Vigyan Kendras are the knowledge hub for latest farming techniques, new and high yielding crop varieties, innovative technologies in agriculture and allied agriculture sectors etc. During the year 2017-18, an opportunity was given to the farmers to practically visit the above places by organizing farmers visit to nearby agriculture university/research station/ KVK. More than 450 farmers benefitted through 8 programmes during the year 2017-18. During the year, 2017-18, 89 and 85 demonstrations had been laid out at farmers field to demonstrate the long term effect of using Biofertilizers and City Compost, respectively on crop growth and yield as compare to farmer’s own practices. The demonstrations are being continued on the same location and on same pattern during the year 2018-19 so that long term effects of using Biofertilizers and City Compost can be shown to the farmers. NFL is playing a vital role in supporting farmers by undertaking soil analysis for major and micro nutrients through its 06 static and 04 mobile soil testing labs in various states. Based on the analysis, farmers are advised on soil fertility management through rational use of manure, fertilizers and other inputs to make agriculture more productive and sustainable. During the year 2017-18, more than 26,000 soil samples were analyzed for major and micro nutrients and recommendations were given to the farmers. During the year 2017-18, NFL continued its endeavor to render soil testing services to the farmer’s doorstep by organizing soil testing campaigns. During these campaigns, services of our Mobile Soil Testing Vans and Laboratory staff were suitably utilized for collecting soil samples by demonstrating the correct method of sampling to the farmers and by offering on the spot soil analysis and advisory on the basis of soil test results. 26 such campaigns were organized in the states of Punjab, Haryana, Rajasthan, HP, J&K, UP, Bihar and Jharkhand and more than 19000 farmers benefitted by these programmes. Agricultural exhibitions and krishi melas aims to bring stakeholders from all disciplines of Agriculture like farming, Livestock, dairy, import and export, poultry and Horticulture sectors under one roof and provides opportunity to demonstrate their products, exchange their views and share ideas for the growth, sustainability and development of these vital sectors of our economy. Participation in agro exhibitions and university Kisan meals is very effective way to communicate directly with the farmers and also to interact with scientists and experts from various agricultural fields. 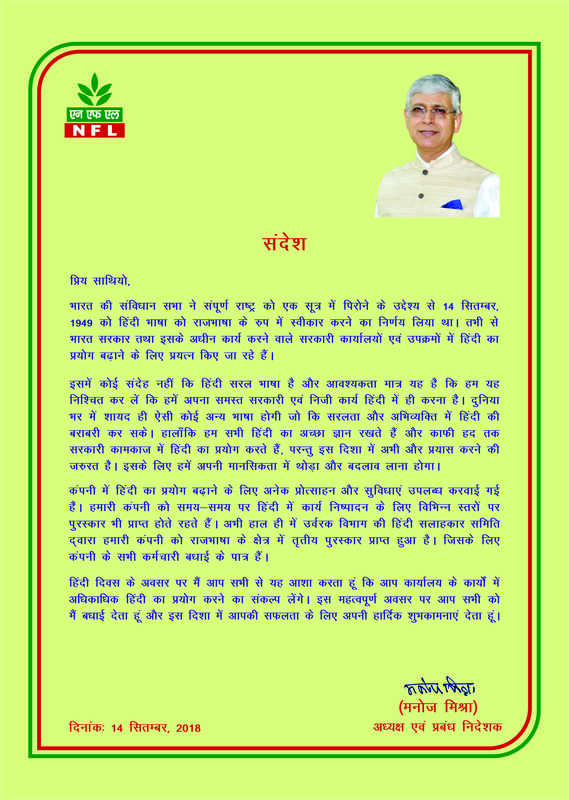 During the year 2017-18, NFL participated in 36 krishi melas/agriculture exhibitions organized by leading agriculture universities, agriculture department in Punjab, Haryana, UP, Uttarakhand, Bihar, MP, Rajasthan and J&K and more than 90 thousand farmers benefitted through these events. As per the guidelines of DoF and with the objective to provide all the agricultural inputs and services to all the farmers along with fertilizers under one roof along with Soil testing and advisory services, 100 Kisan Suvidha Kendras (KSK) were opened by NFL all across its marketing territory. Through these KSKs farmers from nearby villages were educated on various agriculture related topics through 100 farmer training programmes, more than 10 thousand soil samples were collected, analyzed through our static and mobile soil testing labs and reports were given to the farmers. More than 80000 leaflets on NFL products and various crops were also distributed to farmers through various programmes organized in these KSKs.